Zirocco Blue is a modern type stallion showing lots of potential. He jumps with lots of scope and is very careful. With his rider, Jur Vrieling, he is one of the most striking stallions in the stallion competitions having placed 3rd in Assen, 3rd in Roosendaal and 4th in Deurne. Zirocco Blue has a sireline to dream of as Mr. Blue was one of the best horses at the highest level (Grand Prix and World Cups), but also in breeding he proves that he belongs to the top sires in the world. Grandfather is the ‘Preferent’ stallion Voltaire who competed himself at international level and is Sire and Grand-Sire of many International Sporthorses. After Voltaire we find the five best stallions of the Selle Francais studbook. Zirroco Blue’s damline is also noteworthy. His dam, Licorne des Forets, is competing at International 1.50 m. level whilst his grand dam Gekas des Forets competed at 1.40m level and was the most winning 6 year old in France. Grand-Grand dam Rapsodie II also competed at 1.40m level and is a full sister to the approved stallion and Grand Prix horse Stew Boy. This mare line produced several approved stallions, National jumpers and International jumpers such as the 2007 National Champion of France, Lavande des Forets. Dam Azemieka VDL is by the famous Darco. She just missed her ster predicate scoring EX 65/G 70/SPR 75 at her keuring. Azemieka VDL competed to the ZZ-level, earning her sport predicate before returning to the broodmare herd. Her first filly, Ellamieka, is by Corland. Ellamieka earned her ster predicate in 2012. Grand Dam, Uzamieka VDL, is a ster mare from another famous stallion, Indoctro. 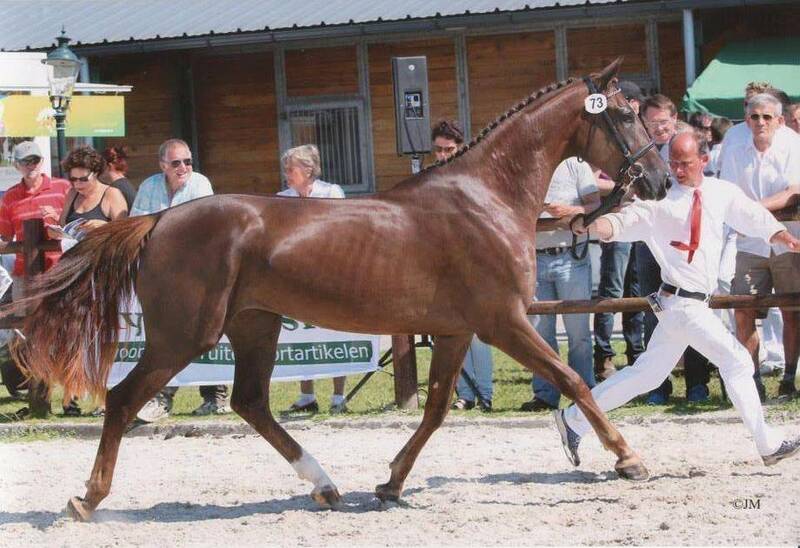 Uzamieka's 2006 son, Bugatti VDL, was approved by the KWPN and now stands at the VDL Stud. 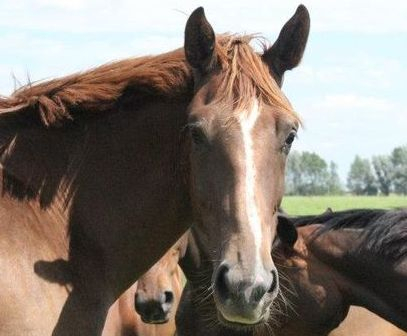 Her mother is the famous mare Aziemieka. She is the mother of the approved stallions and international jumpers Everest, Glennridge and Arkansas VDL. She is also the mother of international jumping horses Lely, North Gammon and Jetzetro. Another daughter of Aziemieka is the European mare champion Helena, who is mother of the Grand Prix jumper Southwind VDL. 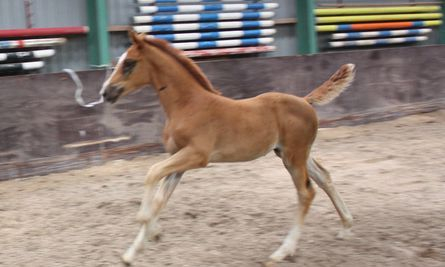 For Azemieka's second foal, we decided to use the up-and-coming stallion Zirocco Blue VDL. The cross had worked well with Azemieka's dam - Uzemieka VDL -Her foal, Desperado VDL placed 4th, at the final of the National Championship. Faiza is all that we could have hoped for with this cross - a true power house! Visiting Faiza in the pastures this past July - I found it hard to believe that she is only 2 years old! She certainly has matured. Faizemieka has come in from the fields. 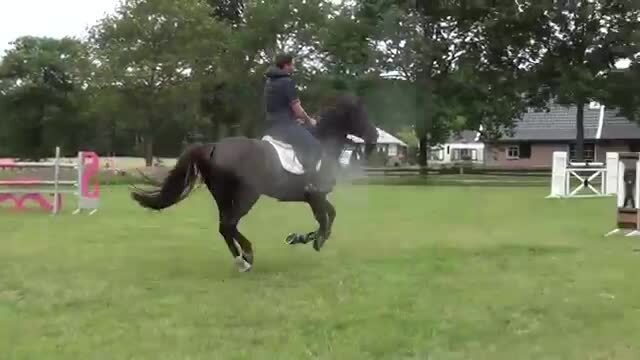 She is now in training with Auke de Jong to prepare for her mare show in July. Here is a photo taken of her on April 22 at the beginning of her training. She will participate in the July 02 keuring at Boijl! She will also be bred one time before heading to an undersaddle career - we have decided to use Zapatero VDL. "Faiza" was an absolute superstar at her keuring - She was SOLD to the VDL stud off her in hand walk and trot alone!! Thankfully she showed enough power and scope in her freejumping amongst all her bucking and showing off to earn her ster predicate with a conformation score of 75 and a jumping score of 80!! She will be heading off to the Central Keuring on July 18th to earn her provisional keur status!! Faizemieka showed extremely well at today's Central Keuring. She easily earned her provisional keur status, placing third in her group and being invited back for the Championship Round. Placing an overall 7th on the day, she also earned her invitation to the National Mare Championship (NMK) held in August during the KWPN Horse Days!! 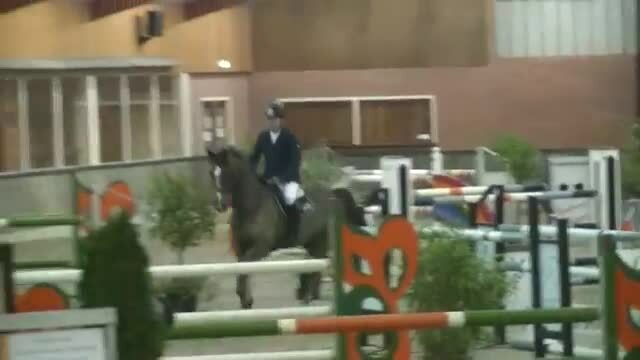 The highest score in IBOP Tolbert was today for Faizemieka VDL (Zirocco Blue x Darco). The mare earned 81.5 points on which they received including a 9 for her reflexes. Faizemieka VDL ridden by Sander Naber. 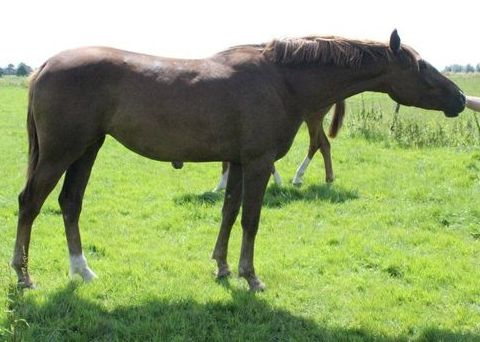 Faizemieka VDL is bred by Canadian Alison Moore from Darco mare Azemieka, which she bought as a young horse at the VDL Stud. 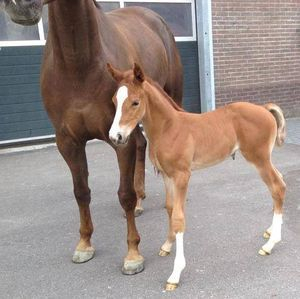 Alison Moore left the mare for breeding and sport in the Netherlands and not without success. The mare jumped at ZZ level and spent two offspring, including a Star mare Corland and Faizemieka. VDL Stud was very impressed with the Blue Zirocco daughter and bought the mare last summer during the pedigree recording. Come from the tribe of Faizemieka many international horses and approved stallions like Bugatti VDL Southwind VDL, Glenn Freeman Ridge and VDL, Champion of the KWPN Stallion Show 2013. Henk and Dirk Dirksen Reijne got to judge during the IBOP in Tolbert . Good group of jumpers today No less than eleven of the thirteen mares failed . In dressage horses that were little more than half , five of the nine . NMK mare Faizemieka ( Zirocco Blue VDL VDL from Azemieka stb sport-jump by Darco , breeder A. Moore of Kanata , Ontaria ) VDL Stud from Bears got 81.5 points . " She has an active , worn canter with a lot of balance ," says Dirksen . " During her jump very good reflexes to fall , as they got a 9 . She expresses herself well and jumps with the withers up . Behind them is the jump well, but she could use some more bodies may have . It seems there is a lot to do . " Dam line Faizemieka is known . Grandmother Uzamieka ( s.Indoctro ) also produced the KWPN stallion Bugatti VDL ( v.Silverstone ) and grandmother Aziemieka ( v.Silvano ) also approved the Glenn Ridge ( v.Wellington ) . 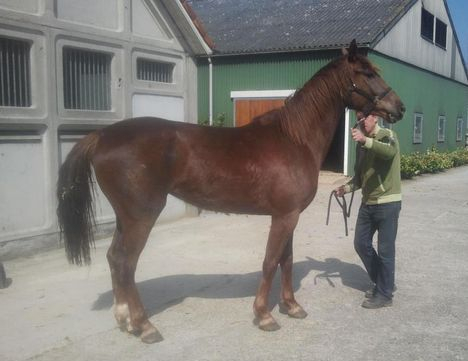 Aziemieka is the grandmother of the recently approved Freeman VDL ( v.Emmerton ) . Many good jumpers have been traced to this line , including Southwind VDL ( v.Baloubet du Rouet ) Cameron Hanley back. Faizemieka is pregnant!! She took on her breediing July 01, 2013 to Zapatero - so she should be due around June 6th! 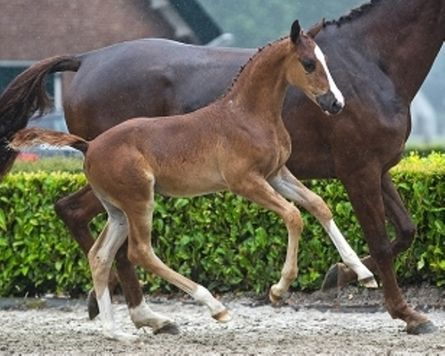 I look forward to seeing the foal when I visit Holland this coming July! I got to visit Faizemieka on my visit to Holland. She is living at Janko's farm with a group of other mares expecting foals late this spring. 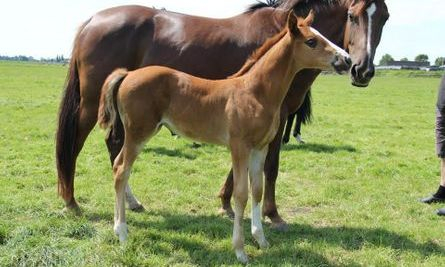 At 328 days, Faizemieka has delivered a beautiful healthy filly out in the fields at VDL! This is a photo of the pair taken on June 02. A July visit to see our first and second generation breeding!! Jaizemieka VDL to be auctioned at the Veulenveiling Borculo. 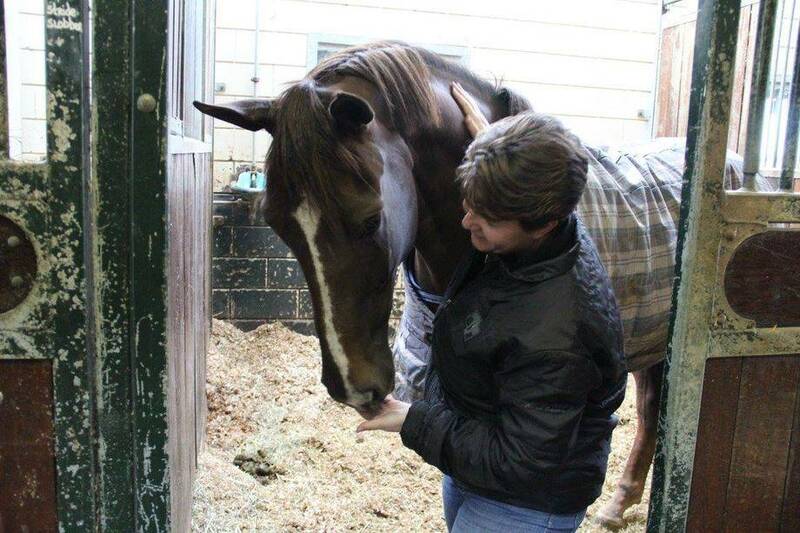 It was so exciting to be reunited briefly with our wonderful mare Faizemieka. She is going under saddle and beginning to go out to the competitions - I can't wait to see what she does!! Faizemieka is now ridden by Robbert Ehrens!! Faizemieka has earned her sport predicate! !